photos of yourself while you eat. The ‘selfie spoon’ is a selfie stick with a spoon at the end that extends up to 30 inches (76.2 cm) so people can take photos of themselves while eating, reports the PTI. 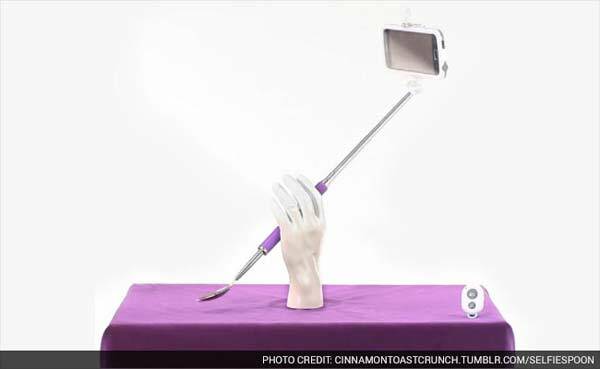 The General Mills brand Cinnamon Toast Crunch created this new spin on the selfie stick to solve the problem of “choosing between eating and posting” a selfie, ‘The Time’ reported. To use the selfie spoon, users have to turn on the Bluetooth feature on their smartphones. There is a gray button that takes photos on Android phones, and one that takes photos on iOS devices. Selfie spoons can be ordered for free on SelfieSpoon.com, though customers do have to pay for shipping.